With the amazing weather we are having, I would say it is time for Punxsutawney Phil to retire. Six more weeks of winter? Yeah right. You definitely won&apos;t hear me complaining though. With all of the great events going on in Loudoun this weekend, the weather will only make everything better so get out your sunglasses, buy your tickets to this weekend&apos;s events and we will see you there! Come celebrate the 30th Annual YMCA Chocolates Galore & More at Lansdowne Resort & Spa featuring, live music from Ted Garber and his full band, celebrities, and some of the best sweets and savory foods in the region. The evening will feature tastings of hors d’oeuvre and dessert specialties from the area’s most talented chefs and bakers. You can dance the night away while enjoying free-flowing champagne, music, dancing, and an auction. Read more in our latest blog and get your tickets now! Join the LoCo Ale Trail and DC101 for the FeBREWary Finale at Vanish Brewery this Saturday, February 25. The intimate experience will feature brewers and owners from 16 Loudoun breweries and the chance to hang out with Roche from DC101. Attendees will receive a commemorative tasting glass with the opportunity to try 16 different versions of this year’s LoCollaboration brew, a milk stout each brewery helped create and then added their own twists—from chocolate and coconut to vanilla and strawberries. 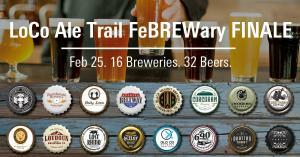 Each brewery is also bringing a brewer&apos;s favorite—32 beers in all for you to sample! Get your ticket today before they sell out!